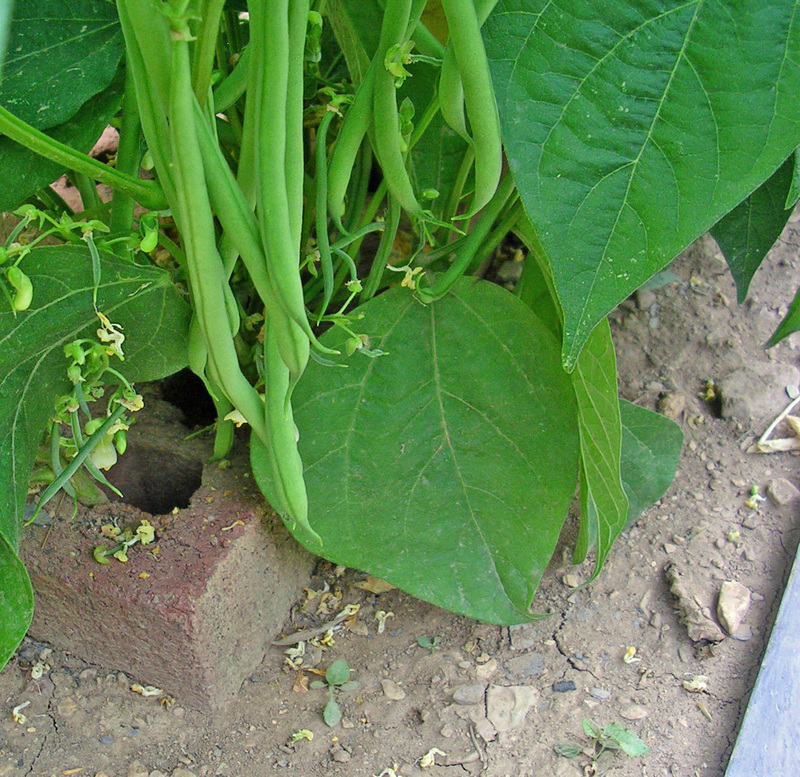 Unlike chicken under a brick, beans in a brick is not a recipe but the way I grow green beans. Every year I had entire rows of French filet beans, aka haricots verts, getting knocked over, a paining sight. Whether it’s the wind on our hilltop, or the weight of the beans that does it, I don’t know. I tried different things, from securing every plant individually with a small stake (tedious and useless) to stretching wire along each side of the row (equally useless). I even called the company where I bought the seeds to find out what they recommend but they did not seem to understand what I was talking about, since the beans are described as self-supporting in the catalog. Then, one day, I was standing outside the car wash waiting when my eyes fell on a pile of bricks nearby. What if I buried the seeds into the holes of bricks and let the plants grow into them? That way the crucial first 1.5 inches of the stem, where the plants always break, would be protected. Lucky coincidence – our local hardware store was just discontinuing selling bricks, so I got a few dozen bricks for free. It worked! I seed the beans very densely, one in every hole, so they also support each other. The most important thing is not to move the bricks the slightest bit after seeding because the small hole is the seed’s lifeline to air and light. Without it, no germination! A few plants still get knocked over, but this is minimal compared to the previous damage. Now it’s almost time to harvest, and I am looking forward to my favorite salad with green beans. The original recipe is from Bon Appetit but because I don’t like raw onions of any kind, I omit the shallots in the dressing. Since with my growing method, I get a good crop of haricot verts, I use three times more green beans than the recipe calls for. Therefore this is not a Potato Salad with Haricots Verts, but a Haricot Verts Salad with Potatoes. 2. Whisk the mustard with the vinegar and olive oil. Stir in the rosemary and sage. 3. Wash the potatoes and toss them whole with 3 tablespoons vinaigrette until they are evenly coated. Spread them in one layer in a baking dish. Bake in the preheated oven for 20 minutes. Reduce the heat to 375 degrees F and bake for another 40 to 50 minutes until they are soft, turning them once in a while. Cool. 4. Bring salted water to the boil in a large pot. Have a large bowl with ice water standing by. Cook the beans in the boiling water for 3 minutes. Drain and throw immerse the beans in the ice water immediately. Swirl them around so they cool evenly. Drain again. 5. Lightly toast the walnuts in an ungreased pan. Chop them coarsely. 6. In a large bowl, mix the potatoes, green beans, cheese, walnuts and the remaining vinaigrette. Season with salt and pepper. Brilliant! and I too would use more beans than potatoes. This sounds wonderful. I wish I had taken photos earlier to show the beens growing into the bricks better. Next time – will seed more green beans this week.